Last month, Alaska’s Gov. Mike Dunleavy proposed ending all state funding for public broadcasting, He is seeking to save $3.6 million to help close a $1.6 billion budget deficit. For the state’s 27 public radio stations, which provide emergency alerts as well as community news, it would be a double whammy. Even with extra federal support for their special circumstances, they count on those state funds to help them qualify for federal funds, their basic Community Service Grants from CPB. Deficit-challenged states are not the only ones tempted to get public broadcasters off their books. Several cash-strapped colleges and universities that own a pubcaster license have eyed an asset they can monetize instead of subsidize – if they just sell it. Consider that about two-thirds of NPR member stations are licensed to, or affiliated with, a college or university, according to NPR’s website. But current trends are working against these institutions. With demographics thinning student pipelines, rising tuitions dampening prospective enrollees, and states cutting higher-ed support, both public and private colleges are looking for revenue. There, in their broadcast studios, millions of dollars beckon. “What we say is that every institutional [college or university] station is one senior vice president away from being defunded,” Ernie Sanchez, a longtime public media lawyer, said wryly. Who ends up with these licenses depends. Stations seldom go dark. Another public broadcaster may step up with a purchase or partnership offer. Quite often a religious broadcaster eagerly opens its wallet. And if a pubcaster’s plight hasn’t been kept secret for too long, friends of the station might rally enough resources to spin it into an independent community broadcaster that will continue its public service mission. Erik Langner, president of Public Media Co., specializes in negotiating some of these transactions, finding buyers or partners for stations about to be divested. He asserts that there has been net gain of some 50 public media outlets in the system in recent years. The additions, however, may not necessarily look or sound like those that have left. Remarkably, because public broadcasting stations operate independently of one another, big-picture data is lacking on just how many stations have been divested, why and who bought them. Similarly, data is lacking on whether those station formats have changed, say, from news and talk to music, or from a station with its own programming line-up to one that just becomes a repeater station, extending a new partner’s signal to a larger area. So let this report serve as a heads up that, in my opinion, such data is something the public should expect from ­­– and ask of – their public media stations. CPB declined say how many TV and radio stations are currently in trouble because they haven’t been able to raise enough non-federal funds to quality for a CPB grant. “Not every station wants their situation advertised,” said Ted Krichels, CPB’s senior vice president for system development and media strategy. He works closely with troubled stations, which have three years to get advice and find more money, or consider a merger or a sale. Qualifying public television stations can get at least $485,500 a year from CPB. Radio stations can get between $57,000 and $100,000 and more based on individual circumstances. All have to raise certain thresholds of outside money and meet staffing and air-time requirements. Sometimes, local supporters wish they had known earlier that their pubcaster was in trouble. When Bradley University announced that it didn't have the funds to move WCBU, Peoria Public Radio, from a campus building that is soon to be demolished, it sought a partnership with WGLT in Bloomington-Normal that would involve sharing equipment and lowering costs. ”We didn’t know of Bradley’s discussions with WGLT until it was reported in the local paper,” Ambra Haake, president of WCBU’s Community Advisory Board, told a public meeting in January, according to local press reports. Community members felt there was no effort to seek their help with an alternate proposal, she said. Moreover, WCBU donors wanted reassurance that their donations would be used for WCBU and not WGLT. Sometimes, owners need to sell to the highest bidder. In other instances, public broadcasters got the chance to transition into a nonprofit, community media organization. 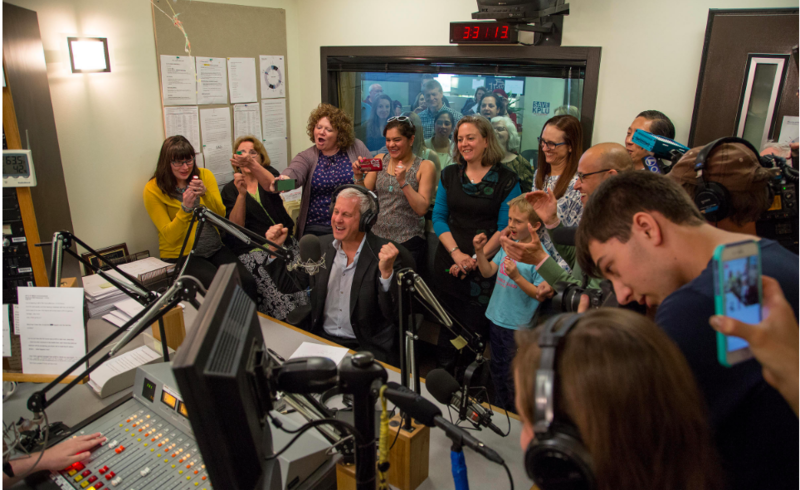 Two years ago, when the struggling Pacific Lutheran University in Tacoma, Washington, needed to sell KPLU, it first approached the University of Washington, which owns rival KUOW. There was a “huge uproar” in the community, said Joey Cohn, general manager. Instead, he led a campaign that raised $7 million in cash for the university in 137 days (and sweetened the deal with $1 million in free underwriting to market the university).The station became KNKX, an independent, community station whose budget and staff has since tripled, he said. A big piece of the problem is the widening gap between the wealthiest public broadcasters and smaller or mid-sized ones. Between 2012 and 2017, non-federal financial support, in the aggregate, for smaller and mid-sized stations public television stations declined by 8 percent, said Krichels; meanwhile, for stations operating on $10 million or more a year, non-federal financial support, in aggregate, increased by 7 percent. CPB funds some 406 radio and 160 public television grantees. Public TV stations must raise some $800,000 in non-federal funds from members, donors and underwriters to qualify for CPB funds. That is hard for some smaller stations. KEET public television in Eureka, California, has been unable to do that for years and has already had three so-called “waivers” from the CPB to try to remedy the situation. It is now fighting to remain independent. It doesn't want to merge with a larger station, which is a frequently offered solution. Another problem is that, at many colleges and universities, support for their public broadcasting licensees has declined in recent years. “There are a number who, without school support, would not be viable,” Krichels said. Consider that two years ago, when Northern Kentucky University opted to sell its public radio stations, it fetched some $6.4 million by selling two to religious broadcasters and one to a country music programmer. It paid off the debt it incurred from buying the stations, but in the process, it declined an offer from Louisville Public Radio to take on one station for $3.5 million in cash plus $1.5 million in underwriting. Past and current situations are numerous. Last year, for instance, Shaw University in Raleigh, N.C., sold WSHA to a religious broadcaster for $3.5 million. The jazz and gospel station was the first public radio station owned by a historically black college. Currently, a community group has been working to raise $3.5 million in cash to buy WYSO from Antioch College in Cold Springs, Ohio. In Maryland, Salisbury University, which operates WSCL and WSDL, is negotiating with the University of Maryland Eastern Shore (WESM), to share resources and lower costs to offset a drop in listenership and underwriting. This follows what Public Media’s Langner says is “an increasing trend of mergers or comprehensive partnerships” that avoid the transfer of a license. To Mollie Kabler, executive director of Alaska Public Broadcasting, the governor’s proposed budget is “a significant threat,” especially to the state’s mid-tier radio stations. “You can’t raise a lot of money because there’s not a lot of people to raise money from,” she said. Last year, West Virginia’s legislature trimmed another $1 million a year from West Virginia Public Broadcasting; layoffs ensued. And in 2011, then-Gov. Chris Christie took New Jersey out of the public broadcasting business, arranging for NJTV to be operated by WNET.org and selling off the state’s public radio stations to pubcasters in New York City and Philadelphia. Public broadcasters often report local news and spotlight local arts and culture, so it is concerning that efforts to consolidate or divest them are coming at a time when local newspapers are also consolidating or being sold off to hedge funds that are focused on profit not mission. Solutions are not easy. Some say that smaller stations deserve a bigger piece of the funding pie; but federal funding to CPB has been flat at about $445 million for several years, although efforts are afoot to ask for more this cycle. Kathy Merritt, CPB senior vice president for journalism and radio, said CPB tries to take into account the special circumstances of individual stations. Station executives and others are meeting this week to offer input on whether CPB funding guidelines should be tweaked. Some ask: Do the mega-stations operating on multimillion-dollar-a-year budgets need federal funding? Consider that colossal WNYC in New York City has a $100 million annual budget, with $52 million coming in annual fundraising. But public broadcasting executives say that larger stations will assert that they deliver more bang for the buck, and they shouldn’t get less support for being successful. While CPB supports efforts to boost fundraising activities by individual public broadcasters, providing training and tools, it is not inclined to get into the business of raising money itself for the system. NPR, however, is planning a national fundraising push in an effort to land major donations, like Joan Kroc’s $200 million. It hopes to cut a deal to share with individual member stations some of the revenues that NPR raises in their backyards. More government funding, federal or state, would be nice. But it is far more likely that public broadcasters will join the ranks of other media organizations struggling to solve the money problem. The likeliest scenario is that the public will have to be a partner, which makes transparency all the more important. You can subscribe to CPB Ombudsman Reports at https://www.cpb.org/subscribe. Read more CPB Ombudsman Reports here.